In a new feature here on PTTP, I will be highlighting some of the books on my ever-growing wishlist. In an effort to spotlight older HF and History Non-Fiction books I thought this would be a good way to bring them to your attention and at the same time get opinions from readers who may have read them. 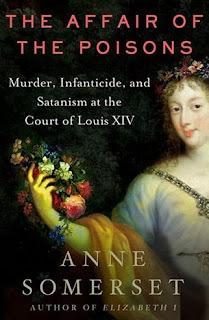 First up is a History Non-Fiction book set in the French court of Louis XIV, The Affair of the Poisons was written by Anne Somerset, who also wrote the follow NF books: Elizabeth I , Ladies in Waiting , Unnatural Murder: Poison at the Court of James I and The Life and Times of William IV . SYNOPSIS: The Affair of the Poisons, as it became known, was an extraordinary episode that took place in France during the reign of Louis XIV. When poisoning and black magic became widespread, arrests followed. Suspects included those among the highest ranks of society. Many were tortured and numerous executions resulted. The 1676 torture and execution of the Marquise de Brinvilliers marked the start of the scandal which rocked the foundations of French society and sent shock waves through all of Europe. Convicted of conspiring with her adulterous lover to poison her father and brothers in order to secure the family fortune, the marquise was the first member of the noble class to fall. In the French court of the period, where sexual affairs were numerous, ladies were not shy of seeking help from the murkier elements of the Parisian underworld, and fortune-tellers supplemented their dubious trade by selling poison. It was not long before the authorities were led to believe that Louis XIV himself was at risk. With the police chief of Paris police alerted, every hint of danger was investigated. Rumors abounded and it was not long before the King ordered the setting up of a special commission to investigate the poisonings and bring offenders to justice. No one, the King decreed, no matter how grand, would be spared having to account for their conduct. The royal court was soon thrown into disarray. The Mistress of the Robes and a distinguished general were among the early suspects. But they paled into insignificance when the King's mistress was incriminated. If, as was said, she had engaged in vile Satanic rituals and had sought to poison a rival for the King's affections, what was Louis XIV to do? Anne Somerset has gone back to original sources, letters and earlier accounts of the affair. By the end of her account, she reaches firm conclusions on various crucial matters. The Affair of the Poisons is an enthralling account of a sometimes bizarre period in French history. So, what do you think dear readers? Sound interesting? Have you read this and can give us your thoughts? I'd love to hear them!! That sounds like an awesome book. even though I don't usually read NF historical books, I would definitely look into this one. I have not read it. But one wonders how many innocents fell in the carnage that followed. Great way to get rid of an enemy eh? I always follow you so I generally follow your recommendations. This sounds awfully good. This book sounds wonderful! I haven't read anything by Anne Somerset (my favorite historical non-fiction writer is Alison Weir) but I will have to try her out. Thank you for the post maybe I have found a new author to follow! This one sounds great, and now I want to add it to my wish list as well! Thanks for the great heads up! !